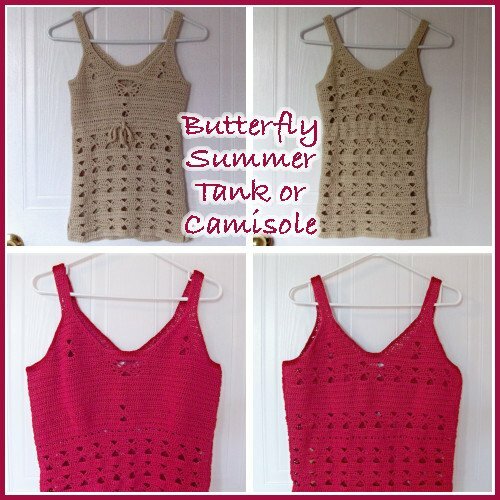 This pretty tank top crochet pattern features a lovely butterfly stitch pattern, which makes this perfect for the summer. If you’re daring you can wear it as is, but I like to wear mine over a spaghetti strap. Instructions are given for size extra small. Sizes small, medium, large and extra large are given in parentheses. The Pattern is designed for a tight fit. Material: Red Heart Luster Sheen (Fine #2) 2, (2, 2, 3, 3) 4oz. skeins. Gauge: Measures 3/4″ over 2 hdc rows, and 2″ over 9 hdc sts. Row 1: (WS) Sc in second ch from hook and in each ch across; turn. 62, (68, 74, 80, 86) sc. Row 2: (RS) Ch 1, hdc in each st across; turn. 62, (68, 74, 80, 86) sc. Row 3: Ch 1, sc in each st across; turn. 62, (68, 74, 80, 86) sc. Row 4: Ch 1, hdc in first 5, (4, 3, 2, 5) sts, ch 4, sk next 4 sts, *hdc in next 4 sts, ch 4, sk next 4 sts; rep from * to up to last 5, (4, 3, 2, 5) sts, hdc in last 5, (4, 3, 2, 5) sts; turn. 34, (36, 38, 40, 46) sts and 7 (8, 9, 10, 10) ch-4 lps. Row 5: Ch 1, hdc in first 5, (4, 3, 2, 5) sts, ch 4, sk next 4 chs, *hdc in next 4 sts, ch 4, sk next 4 chs; rep from * up to last 5, (4, 3, 2, 5) sts, hdc in last 5, (4, 3, 2, 5) sts; turn. 34, (36, 38, 40, 46) sts and 7 (8, 9, 10, 10) ch-4 lps. Row 6: Same as row 5. Row 7: Ch 1, hdc in first 5, (4, 3, 2, 5) sts, ch 2, sc around the 3 lps of prev 3 rows, ch 2, *hdc in next 4 sts, ch 2, sc around the 3 lps of prev 3 rows, ch 2; rep from * up to last 5, (4, 3, 2, 5) sts, hdc in last 5, (4, 3, 2, 5) sts; turn. 41, (44, 47, 50, 56) sts and 14 (16, 18, 20, 20) ch-2 sps. Row 8: Ch 1, sc in first 5, (4, 3, 2, 5) sts, ch 4, sk both ch-2 sps, *sc in next 4 hdc, ch 4, sk both ch-2 sps; rep from * up to last 5, (4, 3, 2, 5) sts, sc in last 5, (4, 3, 2, 5) sts; turn. Row 9: Ch 1, sc in each st and each ch across; turn. 62, (68, 74, 80, 86) sc. Row 10: Ch 1, hdc in each st across; turn. 62, (68, 74, 80, 86) hdc. Row 11: Ch 1, sc in each st across; turn. 62, (68, 74, 80, 86) sc. Rows 4-11 form pattern. Rep another 4, (5, 5, 6, 6) times. Do NOT fasten off. Continue with Bust. Row 1: Ch 1, hdc in first 2 sts, *ch 1, sk next st, hdc in next 2 sts; rep from * to end of row; turn. 42 (46, 50, 54, 58) sts and 20 (22, 24, 26, 28) ch-1 sps. Row 3: Ch 1, working in both lps hdc in each st across; turn. Row 4: Ch 1, sc in first 16, (17, 18, 19, 20) sts, *2 sc in next st, [1 sc in next st, 2 sc in next st] 3, (4, 5, 6, 7) times*, sc in next 16 sts; Rep from * to * once, then sc in last 16, (17, 18, 19, 20) sts; turn. 70, (78, 86, 94, 102) sts. Row 5: Ch 1, hdc in first 33, (37, 41, 45, 49) sts, ch 4, sk next 4 sts, hdc in last 33, (37, 41, 45, 49) sts; turn. 66, (74, 82, 90, 98) sts. Row 6: Ch 1, hdc in first 33, (37, 41, 45, 49) sts, ch 4, sk next 4 chs, hdc in last 33, (37, 41, 45, 49) sts; turn. 66, (74, 82, 90, 98) sts. Row 8: Ch 1, hdc in first 33, (37, 41, 45, 49) sts, ch 2, sc around the 3 lps from prev 3 rows, ch 2, hdc in last 33, (37, 41, 45, 49) sts; turn. 67, (75, 83, 91, 99) sts. Row 9: Ch 1, sc in first 33, (37, 41, 45, 49) sts, ch 4, sk both ch-2 sps, sc in last 33, (37, 41, 45, 49) hdc sts; turn. 66, (74, 82, 90, 98) sts. Row 10: Ch 1, 1 sc in each st and ch across; turn. 70, (78, 86, 94, 102) sc. Row 11: Ch 1, hdc in each st across; turn. Rep rows 11 and 12 another 0, (1, 2, 3, 4) times. Do NOT fasten off, continue with Butterfly Rows. Row 1: Ch 1, hdc in first 30, (34, 38, 42, 46) sts, ch 1, sk next st, hdc in next 2 sts, ch 4, sk next 4 sts, hdc in next 2 sts, ch 1, sk next st, hdc in last 30, (34, 38, 42, 46) sts; turn. 64, (72, 80, 88, 96) sts. Row 2: Ch 1, hdc in first 29, (33, 37, 41, 45) sts, ch 1, sk next st, 2 hdc in next ch-1 sp, ch 6, sk next 2 sts, sk ch-4 lp and next 2 sts, 2 hdc in next ch-1 sp, ch 1, sk next st, hdc in last 29, (33, 37, 41, 45) sts; turn. 62, (70, 78, 86, 94) sts. Row 3: Ch 1, hdc in first 28, (32, 36, 40, 44) sts, ch 1, sk next st, 2 hdc in next ch-1 sp, ch 8, sk next 2 sts, sk ch-6 lp and next 2 sts, 2 hdc in next ch-1 sp, ch 1, sk next st, hdc in last 28, (32, 36, 40, 44) sts; turn. 60, (68, 76, 84, 92) sts. Row 4: Ch 1, hdc in first 27, (31, 35, 39, 43) sts, ch 1, sk next st, 2 hdc in next ch-1 sp, ch 5, sk next 2 sts, sc around the 3 lps from prev 3 rows, ch 5, sk next 2 sts, 2 hdc in next ch-1 sp, ch 1, sk next st, hdc in last 27, (31, 35, 39, 43) sts; turn. 58, (66, 74, 82, 90) sts. Row 5: Ch 1, sc in first 27, (31, 35, 39, 43) sts, sc in ch-1 sp and in next 2 sts, ch 10, sk both ch-5 lps, sc in next 2 sts and ch-1 sp, sc in last 27, (31, 35, 39, 43) sts; turn. 60, (68, 76, 84, 92) sts. Row 6: Ch 1, sc in each st and ch across; turn. 70, (78, 86, 94, 102) sts. Row 7: Ch 1, hdc in each st across; turn. Continue with Side 1 of Front Armhole and Neckline Shaping. Row 1: With right side of work facing, sk first 6, (7, 8, 9, 10) sts, join yarn to next st, draw up a lp, ch 1, hdc in same st, hdc2tog over next 2 sts, hdc in next 7, (8, 9, 10, 11) sts, ch 4, sk next 4 sts, hdc in next 7, (8, 9, 10, 11) sts, hdc2tog over next 2 sts, hdc in next st, leave rem sts unworked; turn. 18, ( ) sts. Row 2: Ch 1, hdc in first st, hdc2tog over next 2 sts, hdc in next 6, (7, 8, 9, 10) sts, ch 4, sk ch-4 lp, hdc in next 6, (7, 8, 9, 10) sts, hdc2tog over next 2 sts, hdc in last st; turn. 16, ( ) sts. Row 3: Ch 1, hdc in first st, hdc2tog over next 2 sts, hdc in next 5 sts, (6, 7, 8, 9) ch 4, sk ch-4 lp, hdc in next 5, (6, 7, 8, 9) sts, hdc2tog over next 2 sts, hdc in last st; turn. 14, ( ) sts. Row 4: Ch 1, hdc in first st, hdc2tog over next 2 sts, hdc in next 4, (5, 6, 7, 8) sts, ch 2, sc around 3 lps from prev 3 rows, ch 2, hdc in next 4, (5, 6, 7, 8) sts, hdc2tog over next 2 sts, hdc in last st; turn. 13, ( ) sts. Row 5: Ch 1, sc2tog over first 2 sts, sc in next 4, (5, 6, 7, 8) sts, ch 4, sk next 2 ch-2 lps, sc in next 4, (5, 6, 7, 8) sts, sc2tog over last 2 sts; turn. 10, ( ) sts. Row 6: Ch 1, sc2tog over first 2 sts, sc in each st and ch to last 2 sts, sc2tog over last 2 sts; turn. 12, (14, 16, 18, 20) sts. Row 7: Ch 1, hdc in first st, hdc2tog over next 2 sts, hdc in each st to last 3 sts, hdc2tog over next 2 sts, hdc in last st; turn. 10 (12, 14, 16, 18) sts. Row 8: Ch 1, sc2tog over first 2 sts, sc in each st to last 2 sts, sc2tog over last 2 sts; turn. 8, (10, 12, 14, 16) sts. Rep rows 7 & 8 until 4 sts remaining ending with row 8. Do Not fasten off, continue with Straps. Row 1: Ch 1, hdc in each st across; turn. Row 2: Ch 1, sc in each st across; turn. Rep last 2 rows another 4, (5, 5, 6, 6) times. FO. Row 1: With right side of work facing, sk center 10, (12, 14, 16, 18) sts, join yarn to next st, draw up a lp, ch 1, hdc in same st, hdc2tog over next 2 sts, hdc in next 7, (8, 9, 10, 11) sts, ch 4, sk next 4 sts, hdc in next 7, (8, 9, 10, 11) sts, hdc2tog over next 2 sts, hdc in next st, leave rem 6, (7, 8, 9, 10) sts unworked; turn. Continue with row 2 of Side 1 of Front Armhole and Neckline Shaping. Row 1: Ch 1, hdc in first 2 sts, *ch 1, sk next st, hdc in next 2 sts, Rep from * to end of row; turn. 42 (46, 50, 54, 58) sts and 20 (22, 24, 26, 28) ch-1 sps. Row 2: Ch 1, sc in each st and ch across; turn. 62, (68, 74, 80, 86) sc. Row 3: Ch 1, hdc in each st across; turn. 62, (68, 74, 80, 86) hdc. Row 4: Ch 1, sc in each st across; turn. 62, (68, 74, 80, 86) sc. Row 5: Ch 1, hdc in first 5, (4, 3, 2, 5) sts, ch 4, sk next 4 sts, *hdc in next 4 sts, ch 4, sk next 4 sts; rep from * to up to last 5, (4, 3, 2, 5) sts, hdc in last 5, (4, 3, 2, 5) sts; Turn. 34, (36, 38, 40, 46) sts and 7 (8, 9, 10, 10) ch-4 lps. Row 6: Ch 1, hdc in first 5, (4, 3, 2, 5) sts, ch 4, sk next 4 chs, *hdc in next 4 sts, ch 4, sk next 4 chs*; rep from * up to last 5, (4, 3, 2, 5) sts, hdc in last 5, (4, 3, 2, 5) sts; turn. 34, (36, 38, 40, 46) sts and 7 (8, 9, 10, 10) ch-4 lps. Row 7: Same as row 6. Row 8: Ch 1, hdc in first 5, (4, 3, 2, 5) sts, ch 2, sc around the 3 lps from prev 3 rows, ch 2, *hdc in next 4 sts, ch 2, sc around the 3 lps from prev 3 rows, ch 2; rep from * up to last 5, (4, 3, 2, 5) sts, hdc in last 5, (4, 3, 2, 5) sts; turn. 41, (44, 47, 50, 56) sts and 14 (16, 18, 20, 20) ch-2 sps. Row 9: Ch 1, sc in first 5, (4, 3, 2, 5) sts, ch 4, sk both ch-2 sps, *sc in next 4 sts, ch 4, sk both ch-2 sps; rep from * up to last 5, (4, 3, 2, 5) sts, sc in last 5, (4, 3, 2, 5) sts; turn. 34, (36, 38, 40, 46) sts and 7 (8, 9, 10, 10) ch-4 lps. Row 10: Ch 1, sc in each st and each ch across; turn. 62, (68, 74, 80, 86) sc. Row 11: Ch 1, hdc in each st across; turn. 62, (68, 74, 80, 86) hdc. Row 12: Ch 1, sc in each st across; turn. 62, (68, 74, 80, 86) sc. Rep rows 11 and 12 another 0, (1, 2, 3, 4) times. Then Rep rows 5-12 once. Fasten off. Continue with Side 1 of Back Armhole and Neckline Shaping. Row 1: With right side of work facing, sk first 4, (5, 6, 7, 8,) sts, join yarn to next st, ch 1, hdc in same st, hdc2tog over next 2 sts, hdc in next 7, (8, 9, 10, 11) sts, ch 4, sk next 4 sts, hdc in next 7, (8, 9, 10, 11) sts, hdc2tog over next 2 sts, hdc in next st, leave rem sts unworked; turn. 18, ( ) sts. Row 1: With right side of work facing, sk center 6 sts, join yarn to next st, ch 1, hdc in same st, hdc2tog over next 2 sts, hdc in next 7, (8, 9, 10, 11) sts, ch 4, sk next 4 sts, hdc in next 7, (8, 9, 10, 11) sts, hdc2tog over next 2 sts, hdc in next st, leave rem 4, (5, 6, 7, 8) sts unworked; turn. Seams: Pin garment together with right sides facing each other. Sew shoulder seams. Sew side seams beginning at the top by the armhole and work down to about 2.5 (3, 3.5, 4, 4.5,) inches from the bottom. Leave rem seam undone to create a side-slit, fasten off. Turn work right side out. Neck edging: With right side facing, join yarn at shoulder seam. Ch 1, sc evenly around neck edge, join with sl st to first sc. Fasten off. Armhole edging: With right side facing, join yarn to side seam, ch 1, sc evenly around armhole edge, join with sl st to first sc. Fasten off. Side-slit edging: With right side facing, join yarn to bottom of undone seam and working right to left, ch 1, sc evenly around both sides of the side-slit. Fasten off. Tie String: Ch 185, (197, 209, 221, 233), sc in second ch from hook, and in each ch across. Fasten off. HI! 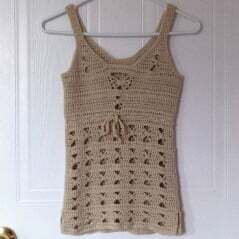 I’m enjoying making this as my first crocheted top, and I’m somewhat new to crocheting… What does ‘sk’ stand for? Also, what does, “sc around the 3 lps of prev 3 rows” mean in Row 7 for ‘Front (bottom section)’. I understand ‘sc’ but ‘around…’ I am unfamiliar with. I ended up sc into each ch (which made the 3 loops) and having about 90+ stitches but only should have had 60 something- I’m making a size small)! Thank you! ‘Sk’ means to skip a stitch, space or loop. It seems that all the increase stitches are on one side working the bust Row 4. Please help. The increases should be on both sides. So you do your first set of increases, sc in next 16 sts adn then begin to increase on the 2nd side. To do that, go back to the first * and repeat everything up to the 2nd *. Then do your last stitches to finish the row. I am making the large, so I sc 19 *2sc in next st, 1sc in next st. 2sc in next st. and repeat this 6 times, sc in next 16 sts. and * to * once then sc in last 19 sts. This is what the instructions state. Ending with 94 sts. Some how the instructions don’t read for same increase on 2nd side. Read #4 on the instructions. and tell me where am I wrong. I’m a bit confused now because you seem to have it right. How many stitches are you ending up with? Okay I will see if I can head into town later today and get some yarn and check it out. 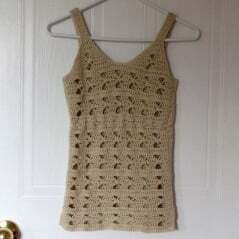 My math is bad too, so I’ll have to actually crochet it up. I’ll try and let you know in a few days from now. Thanks so much for letting me know and I apologize for the trouble. No trouble at all :-) I really appreciate you sharing the pattern. And thank you again for helping me figure it out. 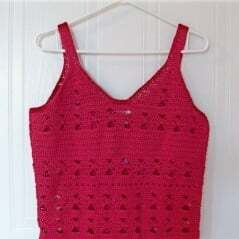 I just learned to crochet, and writing patterns is scary enough that I won’t attempt it lol. Thank you! Any ideas on that top yet? Not sure… I crocheted up the medium and didn’t see any problems … but I’ll be putting it out there for testing next week to see if we can figure it out. Just curious … are you talking about the front or the back piece? I would be needing a size that would fit at least a 44D can you tell me how to incease this patter so it’s not so snug? What is the multiple? That is a really good question. This was one of my first designs, and I didn’t really do a good job at the sizing. To make one butterfly is 8 sts. So you could take the large size and increase the starting chains by 8 sts to give you one extra butterfly. Or, if you look at the starting chains you can see that I increased each size by 6 sts, and then adjusted the amount of sts on the sides as you can see in Row 4. So you could start with 93 chs for a total of 92 sts; and I believe that would leave you with 4 sts at the beginning and end of each side when you begin your butterflies at Row 4. And remember that it is designed for a tight fit, so if you want it loose, you can increase that by 16 or 12 if you wish. One last thing, you’ll also need to make adjustments at the bust, and I really can’t say what your increases would be so trial and error would be your best bet. Hi, I made this pattern up and it turned out beautiful. I used a size 3 baby yarn in yellow and did the extra small. 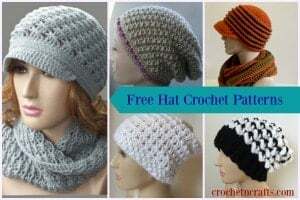 The only question I have is that the pattern I printed says use size 3 light worsted weight yarn but a couple pages later (on my phone screen) it says you used redheart luster sheen which is a size 2 fine. So I was wondering which size is the correct size to be using? Hi Kristie, Red heart Luster Sheen #2 is correct. And just so I can correct it, where did you see it was in a #3? Thanks so much. The front description page says size 3 and further on when you list materials needed it says red heart luster sheen. I can’t wait to make it up in the luster sheen it is such a beautiful top. Several friends and family members have asked me to make one for them. Thank you again for sharing this lovely pattern. Thank you. Has turned out lovely. This looks lovely. I bought some unknown cotton yarn really cheap and just swatched until the size seemed right . Am using a 4.5mm hook and so far it looks brilliant. Thanks for the pattern. 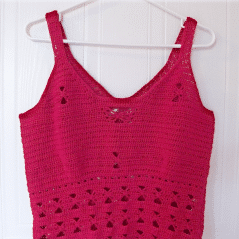 Rhelena – this was easy to follow and made a beautiful top! I made one for each of my two daughters. They were brought to tears by how I was able to make them something so gorgeous! Do you have any other patterns? Could you please supply a link to them if so? Thank you!! Can’t wait to start on this pattern. I love anything with butterflies.